"'Unspeakable' is the rare jazz project that confronts dance grooves and electronica without surrendering to them. Frisell reacts to the beats and samples but never imitates them; he always seems to be proposing alternative methods for divvying up the same pulse or evoking the same mood. Thus we get the best of both worlds -- the power of electronica and the personality of an idiosyncratic musician." Guitarist Bill Frisell's 19th Nonesuch release is a revisiting of an old friendship that stretches back 20 years: as with several previous Frisell projects, it's a partnership with producer Hal Willner (music supervisor for "Saturday Night Live"). Taking fragments of obscure vinyl records as a launching point, the duo traverses a landscape that passes, in an almost hallucinatory way, through myriad styles. A special pleasure is the lush yet piquant string arrangements, played by the 858 Strings . It will not come as a surprise to Frisell's legions of fans that this is an utterly gorgeous and captivating disc ." Following recent excursions into what might simplistically be labeled the blues (on The Willies) and world music (The Intercontinentals), the brilliant 53-year old guitarist here embraces a jazzy kind of post-rock whose most immediate point of reference is the electric Miles Davis. It's a multi-textured, multi-hued disc that never sees Frisell sacrifice his impeccable technique, or neglect the deep structure of his songs, but never sees him forget to have fun either. BILL FRISELL has to be one of the coolest guitarists working in any idiom, and this is one of his coolest albums for years. Taking samples of vintage R&B and funk tracks as their starting point, Frisell and his producer, Hal Willner, have created instrumental themes that unfold in any number of directions while staying true to their dance/groove origins. It is an album of contrasting textures marshalled with consummate artistry. ’Unspeakable’ radiates the kind of authority that only absolute confidence in the primacy of melody and feel in music can confer. Although this is his most "contemporary" album by virtue of Liljestrand's manipulations and Wilner's sampling of ethnic and sound-library recordings, it opens deliberately recherché, with Frisell's octave voicings and darting string arrangement honoring Wes Montgomery and Don Sebesky-the title "1968" presumably refers to the year of Montgomery's death. Frisell's inventive writing for a three-piece string section featuring Jenny Scheinman's violin, Eyvind Kang's viola, and Hank Roberts's cello reveals a talent for orchestration dormant since The Sweetest Punch, his 1998 album of Burt Bacharach and Elvis Costello covers. With Frisell, his rhythm section, the strings, Don Alias's hand drums, Wilner's turntables, and a horn section arranged by Steven Bernstein all going at once, parts of "Stringbean" and a track named for the percussionist are as coded with information - and as edgy - as Miles Davis circa Agharta and Pangaea. As on a conventional jazz album, Frisell's solos are up front. Fortunately, they're as compelling as always. No other jazz guitarist has adapted rock's sonic vocabulary to such personal ends: He uses amplification to make introspection audible. There's never been a jazz musician quite like guitarist Bill Frisell, mainly because jazz makes up only a small segment of his musical world. Frisell, make no mistake about it, is one of the most significant improvisers to emerge in the past 20 years. He rewrote the rules for jazz guitar, radically scaling back the rampant virtuosity that had become endemic to six-string gladiators, while exploring sonic dimensions disdained by mainstream players. There's a whole generation of young guitarists who now belong to Frisell's unofficial school. Yet the avatar himself couldn't be less interested in sticking to the genre in which he's revered. No other jazz musician of his stature has ever willfully delved into as many strikingly different musical styles and genres. Frisell's interests now range widely over country, Americana, film scores, pop, world music, folk and multimedia art collaborations, combining and deconstructing all of the aforementioned and then some. Frisell is as much a composer, bandleader and musical conceptualist as he is a player, and his many confirm this. His latest, "Unspeakable," goes out on a limb, even for Frisell. In league with the adventurous producer Hal Willner, he serves up an unclassifiable musical melange whose bare-bones melodies, elemental dance-influenced funk grooves and liberal use of sampling and turntable manipulation (courtesy of Willner) roughen up Frisell's more familiar pastoral leanings. It's also telling that engineer Eric Liljestrand receives co-composer credit on a few songs; his sonic fingerprints are a palpable presence throughout. Where does this leave Frisell? What moments of guitar glory that are present are mainly in a vicious blues-rock vein. Yet tasty guitar licks and fills make up the marrow of the album... Frisell the consummate tonal colorist (and closet funkmeister) is omnipresent. His slinky arrangements also deftly weave a compact string section in and about the proceedings, lending additional melodic interest and odd undercurrents to the minimal tunes. "Unspeakable" may or may not give us clues to Frisell's future musical plans, which is just the way he likes it. One never knows what to expect from prolific guitarist Bill Frisell. Last year's wildly imaginative and Grammy-nominated ``The Intercontinentals'' dove into world music. Before that he released an acoustic Americana set and a fine jazz session with Dave Holland and Elvin Jones. His partner on ``Unspeakable'' is film score veteran /``Saturday Night Live'' music supervisor Hal Willner. Together, they rummaged through NBC's well-stocked record library in search of weird and wonderful sounds on obscure vinyl. These samples, plus Frisell's frisky guitar riffs, a rhythm section, string trio and funky horns result in a sublime 72-minute trip. “Unspeakable'' should generate a lot of talk come Grammy time. 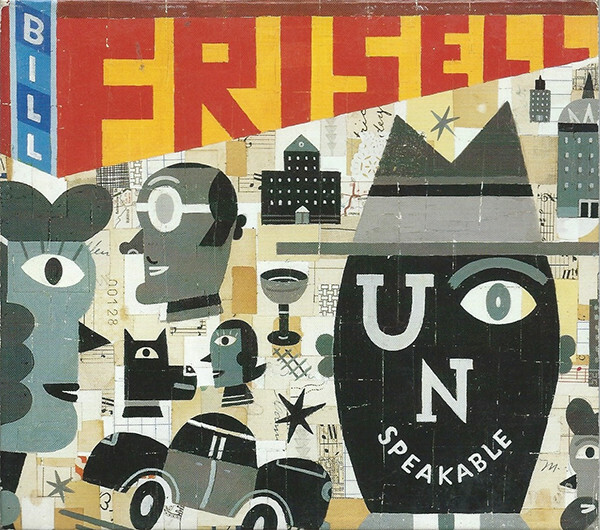 "Unspeakable" by jazz guitarist Bill Frisell is full of surprises. His balmy riffs meld with cello, horns, turntables, and samples for cuts that are soulful, salty, soothing, spacey -- and great fun. "Unspeakable" by Bill Frisell is the "Bill and beats" dance album promised by producer Hal Willner last spring. It seems to exist in a parallel universe, a science-fiction construct that makes you wonder what the world would be like had some "tipping point" moment gone a different way. "Unspeakable" makes you think: what if people really danced to music like this?